Passport Photos for up to five people for just £10 ! 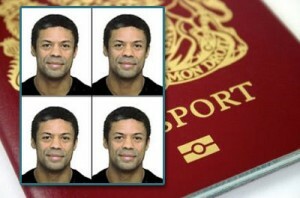 UK Passport Photos for up to five people for the price of one! Strict new rules to combat passport fraud have resulted in tens of thousands of UK passport applications being rejected each year because of the photographs. No smile, no shadows on the face or background, spectacle frames mustn’t cover any part of the eye, no reflections, no tint, no distortion. The background must be between 5% and 10% grey (not white). The list goes on! Almost every day we see customers who have had their “photo booth” pictures rejected as unsuitable. We’ve even seen some rejects which were produced elsewhere professionally! Especially those done on “Instant Passport Photo” cameras which can fail because of the difficulty in gauging the “chin to crown” measurement. These also need be operated at the correct temperature or the image will be too light or too dark. For this reason we now produce our passport photos by hand to meet the exacting requirements for the new biometric passports, licences and ID cards and can guarantee* they will be accepted by the authorities. We always endeavour to make your passport photograph as nice as possible within the new rules, and take several so you can choose the best. Nab it now for just a tenner. One voucher per person/household, additional may be purchased as gifts. All persons included on your voucher must attend the same appointment. Voucher is valid for one month and may not be used with any other offer or promotion. Images and content copyright ©BeautyPhoto.co.uk all rights reserved.